A Bay Area musician has received a national award for his work teaching and preserving traditional Mexican folk music. Artemio Posadas was honored with the 2016 Bess Lomax Hawes NEA National Heritage Fellowship by the National Endowment for the Arts in Washington, D.C. on Friday. The San Jose resident teaches regional folk music called "son" and traditional instruments like the huapanguera, jarana and violin at Richmond's East Bay Center for the Performing Arts. The award recognized Posadas' study of son huasteco, a traditional style of music from his home state of San Luis Potosi in northern Mexico. He learned to play from his father, a violinist, and studied the repetoire and the lively stomping dance that provides rhythm to son. "The award recognizes that there's a great richness in traditional Mexican son," said Posadas, who moved to the Bay Area in 1979 and later became a citizen. Son is social music, played at parties and dances, and passed down through families or from veteran musicians to novices. It's improvised, like jazz or bluegrass, with call-and-response patterns, a trademark falsetto voice, and basic structures that musicians use to elaborate on traditional lyrics and tunes. In the Bay Area, Posadas organizes regular fandangos to preserve son the way it's played and appreciated in pueblos across rural Mexico. He's 68 but still stomping along and hoping to keep teaching for another decade. Posadas' knowledge lives on in his students, including Lolis Garcia, who started playing with the maestro when she was 10 and now teaches herself, and Abigail Armendariz, 20, whose feet fly across the wooden platform called a "tarima." Armendariz said son is like American hip-hop, because singers freestyle, there are variations in style for different regions, and it's party music. "I teach. I preserve. I play." HERE AT THE EAST BAY CENTER FOR THE PERFORMING ARTS, HIS STUDENTS CALL HIM MAESTRO. HE TEACHES TRADITIONAL MEXICAN INSTRUMENTS, DANCE, AND THE REGIONAL MEXICAN MUSIC CALLED "SON." "Son is community music. People get together, have a party and play. That happens in different areas of Mexico." AND NOW IT HAPPENS HERE IN THE BAY AREA, THANKS TO "FANDANGOS" LIKE THIS ONE ORGANIZED BY POSADAS. 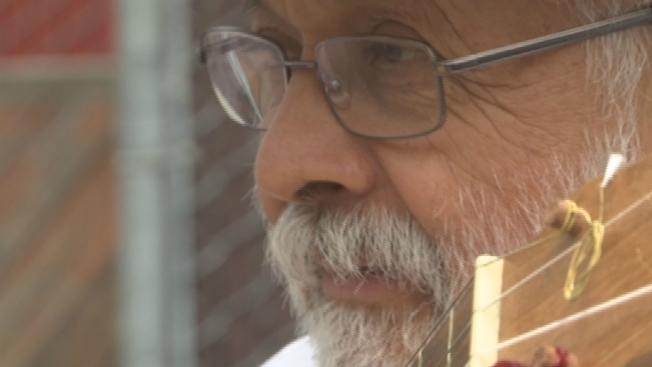 AT AGE 68, POSADAS SAYS HE DOESN'T TRY TO BE THE BEST "SONERO," ONLY TO PASS ON AS MUCH TRADITIONAL MUSIC AS HE CAN TO THE NEXT GENERATION. The NEA says the fellowships are the "nation's highest award for traditional and folk arts." Posadas was honored along with Mardi Gras Indians, Native American basketmakers, and accordionists.